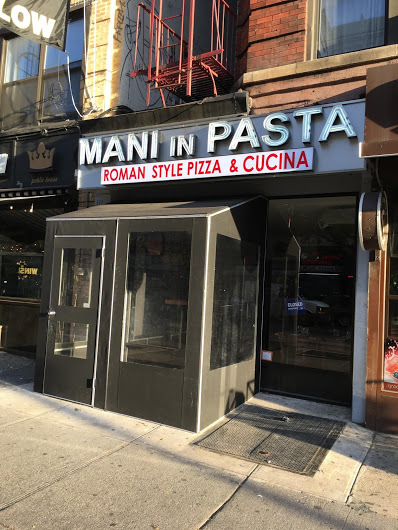 Mani in Pasta opened back in December at 245 E. 14th St. between Second Avenue and Third Avenue. Haven't heard anything about the place. Until now! Rob Patronite and Robin Raisfeld at New York magazine are impressed by the restaurant's Roman-style pizza via Giuseppe Manco, the pizzaiolo-chef and co-owner. The pan pizza "is terrific — the crust dark and crackly around the edges, the tender crumb boasting the kind of webby, widely inscribed holes that hint of long fermentation. Manco attributes its texture to high-hydration dough that lazes about developing flavor for a whopping 96 to 110 hours, and the blend of flours he uses: wheat, soy, rice, and semolina." Toppings fall on the spectrum somewhere between Neapolitan restraint and modern-Roman-pizza-maker whimsy. We particularly liked the carbonara and the Regina Margherita, in spite of the fact that the latter’s halved cherry tomatoes flew off the slices when we picked them up like drunken lumberjacks at a log roll. You can also get the pan pizza by the slice at a mostly takeout Mani in Pasta satellite in Midtown East, but then you’ll miss out on the comparatively deluxe surroundings and cheerful vibe at the East Village nook (a half-dozen-or-so tables, cloth napkins, the occasional Felliniesque gathering of Italian expats), not to mention the tag-team table service — enthusiastic and hands-on but never-intrusive — provided by Manco and his business partner Pietro Toscano. The Manu in Pasta website and menu are here. That pizza looks tasty ! It looks like Joe & Pats Pizza have some real competition. The pizza here looks incredible, plus this place has the advantage because it’s actually open. I've copped slices there several times, and the pizza is indeed delicious. This spot SEEMED to have a slow start but definitely have seen more patrons at the tables in the past two weeks or so. Apparently "Mani in Pasta" is a pun in Italian, one so funny that my Italian-from-Italy friend started laughing when she passed it in the street and decided she had to go there. So I'm glad to hear their food, not just their name, is good! @8:56am: Can you tell us what the pun is about? Would love to know!